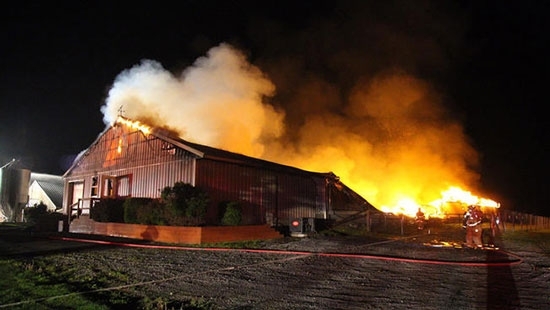 A fire overnight in a central Pennsylvania chicken house killed almost 20,000 birds. Lancaster County fire crews responded to the blaze at 331 Walnut Run Road in Strasburg Township at 12:30 a.m. Sunday. The chickens were just brought in to the barn last Monday. According to Chief Wesley Hicks of the Refton Fire Co. nine engine companies, 13 tanker companies, and two truck companies brought the fire under control in about three hours. There were two chicken houses on the property but only the one caught fire. 19,750 chickens were in the building. Damages are estimated at $670,000. The cause of the fire is under investigation. Philadelphia emergency crews responded to the Philadelphia VA Medical Center in University City this afternoon for the report of a leak. It happened around 5 p.m. on the 3900 block of Woodland Ave. The hazmat situation was quickly placed under control when fire department personal determined that meters had been tripped but there was no actual leak. The scene was cleared around 6 p.m. The VA Hospital released this statement. On Sunday, April 30, an Ethylene Oxide (ETO) detection alarm activated in the Sterile Processing Service (SPS) area of the Corporal Michael J. Crescenz VA Medical Center at 5:00 p.m. ETO has not been in use at the facility since October 2016. The alarm was a false alarm, and we are investigating what triggered it. There was never any danger of a health risk to patients, staff or visitors to the facility. Staff in the SPS area was evacuated as a safety precaution. A suspicious device was found on the street in North Philadelphia this afternoon. It happened just before 4:30 p.m. on the 2000 block of West York Street. The fire department and bomb squad were called. Officials say it was a large container that smelled like gasoline. It had an item on top that looked like a fire cracker or rocket. Nearby homes were evacuated while authorities investigated. The area was cleared and people were allowed to return by 5 p.m. No word on where the container came from or why it was in the street.